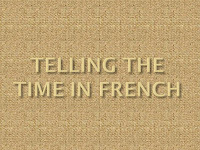 To express time in the sense of telling time, French uses l’heure. To ask the time, say: Excusez-moi, quelle heure est-il? Excuse me, what time is it? • French expressions for telling time always use the third-person singular form of être, preceded by the impersonal il (Il est... ). Start by learning the expressions for telling time on the hour, from one o’clock to eleven o’clock. From two o’clock on, heures is plural. • Twelve o’clock noon and midnight are expressed in French with midi and minuit. • To ask at what time something happens, use à quelle heure in the question, as follows. The answer is expressed with à _ the time of day. À quelle heure commence le cours? (At) What time does the class start? —À dix heures. —At ten (o’clock). À quelle heure déjeunes-tu? What time (When) are you having lunch? —À midi. —At noon (twelve o’clock). • To indicate A.M. and P.M., use du matin (in the morning), de l’aprèsmidi (in the afternoon), and du soir (in the evening). Il est huit heures du matin. It’s eight A.M.
Il est trois heures de l’après-midi. It’s three P.M.
Il est dix heures du soir. It’s ten P.M.
and entertainment schedules, and for making appointments, to avoid ambiguity. Note the abbreviation h for heures when the time is given in fi gures. • To express time after the hour, state the hour _ the number of minutes. Il est une heure vingt. It’s 1:20 (twenty minutes past one). Il est cinq heures dix. It’s 5:10 (ten minutes past five). Il est deux heures cinq. It’s 2:05 (five minutes past two). Il est huit heures quarante-cinq. It’s 8:45 (eight forty-five). When it is a quarter after the hour, use quinze (fi fteen) or et quart (and a quarter). Il est trois heures quinze. It’s 3:15. Il est six heures et quart. It’s 6:15. When it is half past the hour, use trente (thirty) or et demi(e) (and a half). Demie is feminine (with a final -e) when it qualifi es heure(s); it is spelled demi (masculine) when it qualifi es midi (noon) and minuit (midnight). Il est neuf heures trente. It’s 9:30. Il est huit heures et demie. It’s 8:30. 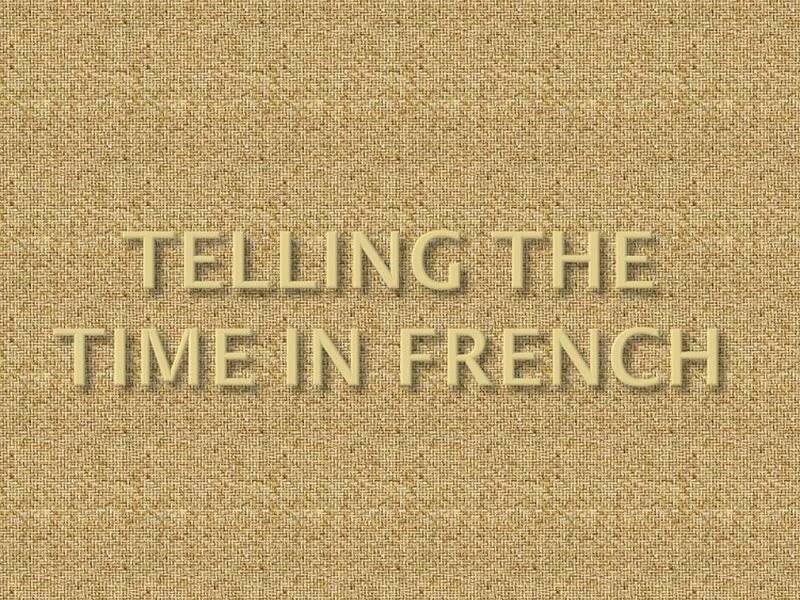 Il est dix heures et demie. It’s 10:30. Il est midi et demi. It’s 12:30 (P.M.). Il est minuit et demi. It’s 12:30 (A.M.). • To express a time before the hour, state the hour _ moins (minus) _ the number of minutes. For fi fteen minutes to (before) the hour, use moins le quart. Il est trois heures moins dix. It’s 2:50 (ten minutes to three). Il est onze heures moins cinq. It’s 10:55 (fi ve minutes to eleven). Il est neuf heures moins le quart. It’s 8:45 (a quarter to nine). Il est midi moins le quart. It’s 11:45 (a quarter to twelve [noon]). As in English, you can add minutes to the previous hour to express time before the hour. Il est quatre heures trente-cinq. It’s 4:35 (twenty-fi ve minutes to five). With the following expressions, the sentence has a personal subject pronoun or noun. de bonne heure. early in the morning. Amélie est en retard ce matin! Amélie is late this morning! On arrive en avance pour avoir une place. We arrive early to get a seat. Il n’est pas toujours facile d’être à l’heure. It isn’t always easy to be on time.